As Americans prepare to celebrate the country’s birthday, a clear majority considers the U.S. to be one of the greatest countries in the world. But the view that the U.S. is exceptional – standing above all other countries in the world – has declined 10 points since 2011. Three years ago, 38% said the U.S. stood above all others, while 53% said it was one of the greatest nations and 8% thought some others were better than the U.S. This data comes from the Pew Research Center’s political typology survey, released June 26. Be sure to take our quiz to see where you fit in the political typology. The decline in the view that the U.S. is the greatest country in the world has occurred across most demographic and political groups, but it has been particularly acute among Republicans. 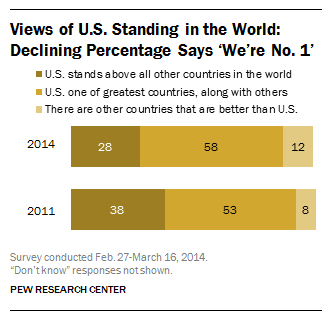 In 2011, 52% of Republicans said the U.S. stood above all other countries in the world, while 43% said it was one of the greatest countries in the world, along with some others. Today, Republicans are 15 points less likely to say the U.S. stands above; 37% say it does, while 55% say the U.S. is one of the greatest countries, along with some others. Democrats and independents continue to be less likely than Republicans to view the U.S. as exceptional, and fewer say this today than did so in 2011. 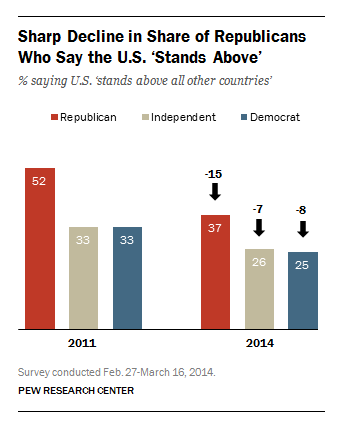 Currently, about a quarter of Democrats and independents say the U.S. stands above all other countries in the world (down from about a third in 2011). Still, most Democrats view the U.S. as among the greatest nations in the world: 62% say it shares this status with some others, while 25% say it stands above. Similarly, a 57% majority of independents say the U.S. is one of the greatest, along with others, and an additional 26% say it is exceptional. 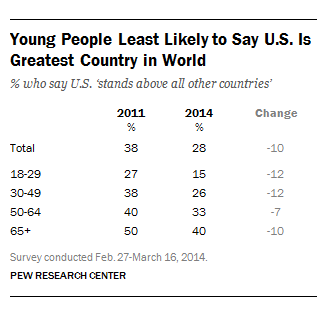 As was the case three years ago, young people are far less likely than older Americans to say that the U.S. stands above all other nations: Just 15% of those under 30 express that view today, down from 27% three years ago. Yet the belief that the United States “stands above” other countries has slipped among all age groups since 2011, including among those 65 and older, who remain the most likely to think that the U.S. is superior to all other countries.